This system supports dual mobile racks for more convenient replacement and reservation. The DVR can be programmed to zoom images in full screen while sensor detecting motion. It can also be programmed to select rotation display in full screen for real time watching. • Programmable recording schedule for continuous, manual or event driven recording. • Can be connected to any TV, no special monitor required. • Advanced image compression technology, 40GB hard drive giving up to two months recording time. • Supports dual hard disks. Selectable overwriting when full. • OSD ( On Screen Display) menu for easy operation. • Complete 4 channel stand alone DVR- no PC required. • Real-time watching and digital recording from up to 4 cameras simultaneously. This camera provides is exellent work horse pan and tilt camera suitable for use in single or multi-camera installations. 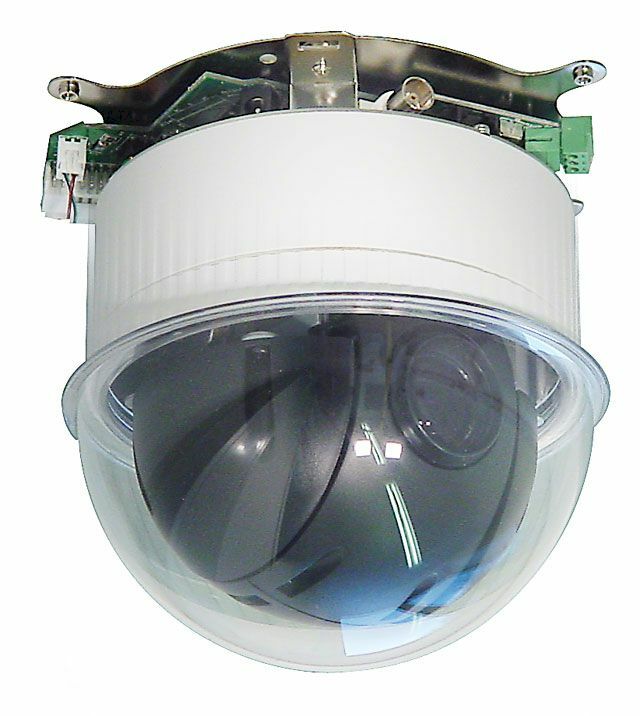 Protex controller for pan/tilt dome camera A controller suitable for use the Protex PXD50 motorised Pan/Tilt dome camera. Digital HD Recording & Remote Vision Software and PCI card. Our x-vision system features Digital Recording of up to 1, 4, 8 or 16 Cameras directly on to Hard Drive, simultaneous playback & recording, Remote Viewing & Webcam functions. The x-vision system is supplied ready to use with the x-vision software and card simply plug in the PCI card, install the software then simply turn on, plug in your cameras, set up the required features and enjoy the benefits of one of the most powerful CCTV systems in the world. Alternatively for those wishing to use there own PC, the system is also supplied as a PCI camera interface card and software. The x-vision system can record at a much higher frame rate and resolution than traditional Multiplexer and Time Lapse VCR combinations. In addition to Remote Viewing functions the Webcam feature will send continuously updated images from the cameras, directly to the www via an ADSL line (click on the demo button above), these can then be viewed from any PC in the world running Netscape or Internet Explorer. You can record up to 16 cameras independently at the same time without interruption while viewing live images of the cameras as a multi camera or individual camera view, you can even playback recordings made earlier without interrupting the current recording. All recordings are made on to the integrated Hard Drive and each camera is recorded without interruption just as with a traditional multiplexer, and because the recordings you have made are digitally stored on to the hard drive, you can zoom in during playback, search and go to a specific time in the recording in seconds, and if you have a printer attached you can even print off an image from the recordings. Digital storage also means that you can replay the recordings over and over again without any loss in picture quality and with a better picture quality than conventional VHS recordings. To increase the recording time and reduce wasted recordings with no movement, the x-vision system can record only when movement occurs. To reduce the chances of false alarms it is possible to specify the sensitivity of the motion detection feature. Once movement has been detected by the system, as well as recording locally it can dial out to any phone and play a user recordable message alerting you of the fact that the computer has detected movement, or alternatively alert a pager with a text message. If you have received notification of movement being detected or you simply want to check on your premises while you are away, you can dial in to the x-vision system from a Windows PC or Laptop from anywhere in the world and watch or record all the cameras together or each one individually. The x-vision system can send images from the cameras connected to it directly to the www. Enabling you to view your cameras from any PC with internet access, even from a PC at an Internet Cafe (click on the Demo button above to see this in action). When connected to a Network the MultiCam system can send images from the cameras to all the other PC’s on the Network. Remote recording is also possible, via the www and LAN. Three different frame rates are available, 15 fps (similar to a Time Lapse Video & Multiplexer), 30 fps (the standard for Digital HD systems, twice the rate of a Time Lapse Video & Multiplexer), and 120 fps (8x faster than a traditional multiplexer CCTV system), this is automatically divided amongst the active cameras, or can be set by the user for each camera, for example on a 8 camera system you could have 4 cameras with a high frame rate, and the other 4 at a low rate. The 15 fps system is recommended for general recording in domestic and small business environments, for critical applications such as watching cashiers at checkouts, where missing a split second would allow the cashier to commit theft, or for high risk applications we recommend the 120 fps system, for all other situations that fall in between these two examples we would recommend the 30 fps system which is still twice as fast as a traditional multiplexer CCTV system. The Covert Camera option allows you to record cameras connected to the system without displaying them on the monitor, so anyone looking at the monitor will not be aware of any hidden (covert) cameras being recorded. To stop the digital recordings being tampered with all the recordings are dated and digitally water marked. An integrated Composite & S-VHS output allows you to display your cameras on an SVGA monitor and/or a TV or CCTV Monitor. These outputs can also be used for connecting the system to a traditional VCR. To further increase the recording time available on your hard drive and to ensure the system is only recording when you require it to. A weekly, monthly and yearly timer can be setup quickly and easily. All the features of the system are quick and easy to set up and all the setup features can be protected by a user defined password so that only authorised people will have access. For 100% compatibility we recommend the use of Zyxel Modems and ISDN TA's only. Others may be compatible but we cannot guarantee this. Windows 98 / 98SE / ME / 2000 / XP Multimedia PC with either Network, ISDN or Modem connection, or if using Web Cam function then any PC/Internet Device running Internet Explorer 4.0 or higher.